Marilynn Louise Smith (April 13, 1929 – April 9, 2019)  was an American professional golfer. She was one of the thirteen founders of the LPGA in 1950. She won two major championships and 21 LPGA Tour events in all. She is a member of the World Golf Hall of Fame. Women's golf has a set of major championships which parallels that in men's golf, with the women's system newer and less stable than the men's. As of 2013, five tournaments are designated as majors in women's golf by the LPGA Tour. Smith was born in Topeka, Kansas. She started playing golf at age 12. She was a three-time winner of the Kansas State Amateur from 1946-48. She won the 1949 national individual intercollegiate golf championship while attending the University of Kansas. The Fort Wayne Open was a golf tournament on the LPGA Tour, played only in 1954. It was played at the Orchard Ridge Country Club in Fort Wayne, Indiana. Marilynn Smith won the event. She died on April 9, 2019, four days before her 90th birthday. The 1954 LPGA Tour was the fifth season since the LPGA Tour officially began in 1950. The season ran from January 15 to October 31. The season consisted of 21 official money events. Louise Suggs and Babe Zaharias won the most tournaments, five each. Patty Berg led the money list with earnings of $16,011. The 1955 LPGA Tour was the sixth season since the LPGA Tour officially began in 1950. The season ran from January 6 to October 9. The season consisted of 27 official money events. Patty Berg won the most tournaments, six. She also led the money list with earnings of $16,492. The Mile High Open was a golf tournament on the LPGA Tour from 1955 to 1956. It was played at the Lakewood Country Club in Lakewood, Colorado, a Denver suburb. Fay Crocker was a Uruguayan professional golfer who played on the LPGA Tour. In her career, she won 11 LPGA tournaments, including two major championships, the 1955 U.S. Women's Open and 1960 Titleholders Championship. Crocker was the oldest player to win her first LPGA event, the first U.S. Women's Open champion from outside the United States, and the oldest women's major champion. Mary Kathryn "Mickey" Wright is an American former LPGA Tour professional golfer. She became a member of the tour in 1955 and won thirteen major championships and 82 LPGA Tour career events. She is a member of the World Golf Hall of Fame. Karrie Ann Webb is an Australian professional golfer. She plays mainly on the U.S.-based LPGA Tour and also turns out once or twice a year on the ALPG Tour in her home country. She is a member of the World Golf Hall of Fame. She has 41 wins on the LPGA Tour, more than any other active player. Kathrynne Ann Whitworth is an American professional golfer. Throughout her playing career she won 88 LPGA Tour tournaments, more than anyone else has won on either the LPGA Tour or the PGA Tour. In 1981 she became the first woman to reach career earnings of $1 million on the LPGA Tour. She is a member of the World Golf Hall of Fame. Mae Louise Suggs was an American professional golfer, one of the founders of the LPGA Tour and thus modern ladies' golf. Elizabeth Earle "Betsy" Rawls is an American former LPGA Tour professional golfer. She won eight major championship and 55 LPGA Tour career events. She is a member of the World Golf Hall of Fame. Beverly Hanson was an American professional golfer who played on the LPGA Tour. Mary Lena Faulk was an American professional golfer. Yani Tseng is a Taiwanese professional golfer playing on the U.S.-based LPGA Tour. She is the youngest player ever, male or female, to win five major championships and was ranked number 1 in the Women's World Golf Rankings for 109 consecutive weeks from 2011 to 2013. Mary Ruth Jessen was an American professional golfer. She became a member of the LPGA Tour in 1956 and won 11 LPGA Tour victories in all. Margaret "Wiffi" Smith is an American professional golfer who played on the LPGA Tour. The St. Petersburg Women's Open was a golf tournament on the LPGA Tour from 1954 to 1989. It was played at three different courses in the St. Petersburg, Florida area. The Peach Blossom Open was a golf tournament on the LPGA Tour from 1953 to 1966. It was played at the Spartanburg Country Club in Spartanburg, South Carolina. Betsy Rawls, Spartanburg native, hosted the event. The Sunshine Women's Open was a golf tournament on the LPGA Tour from 1959 to 1963. It was played at the Miami Springs Country Club in Miami Springs, Florida from 1959 to 1962 and at the LeJeune Golf Club in Miami, Florida in 1963. Alice Bauer was an American golfer. One of the founders of the LPGA, she played professionally and finished as high as 14th on the LPGA Tour money list, in 1956. 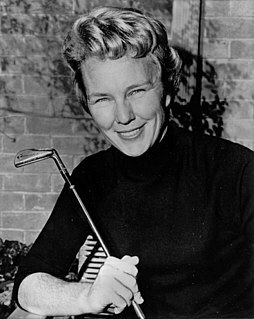 Bauer had several top-10 finishes in major championships, including fourth place in the 1958 U.S. Women's Open. ↑ Sirak, Ron (April 9, 2019). "LPGA Founder and World Golf Hall of Fame Member Marilynn Smith Dies at 89". LPGA. ↑ "LPGA founder Smith selected for World Golf Hall of Fame". PGA Tour. June 7, 2006. Archived from the original on March 12, 2007. ↑ Kelley, Brent (April 4, 2017). "LPGA Founders: The 13 Women Who Created the LPGA – Marilynn Smith". ThoughtCo.com.